The night sky is full of stars and although some may shine brighter than others, they all have their place in a tapestry that reaches deep into milky way. The same can be said for Montreal’s equally vast culinary scene. I get to spend my nights rubbing elbows with this city’s finest chefs and restauranteurs, eating their food and bringing the results back to this swanky blog. Each of these very talented chefs, be they Martin Juneau, Normand Laprise, Derek Bocking or S’Arto Chartier-Otis, all share something in common – they all have their place in Montreal’s best kitchens and they’ve worked hard to get to where they are in their careers. Each of these chefs and their peers across the city have all helped put Montreal on the world’s culinary map. We are very clearly one of North America’s best cities for restaurants and food culture and I will always go out of my way to support and promote that culture. 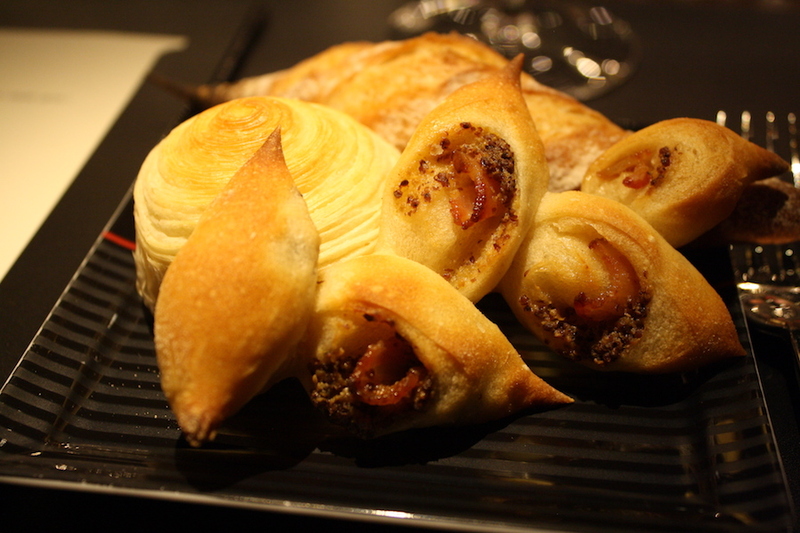 A lot of controversy was stirred up about money and public consultation after the opening of l’Atelier de Joël Robuchon a couple of weeks ago. Like a pack of hungry wolves, some of Montreal’s more sardonic media and their hot-to-trot cronies, who are often there to chime in when it serves their kick-up-a-stink agenda, went after the government, the casino and M. Robuchon like they were the first morsels of juicy food news to come along in months. At the height of the controversy (more like a storm in a teapot?) and without all the facts, many of us shared and commented on articles on social media (most likely without having read them) that got our blood pumping. While some of us managed to keep our comments respectful others ended up looking petty and arrogantly ignorant. Montrealers are a passionate people when it comes to just about anything involving our city but we’re especially passionate about our food. 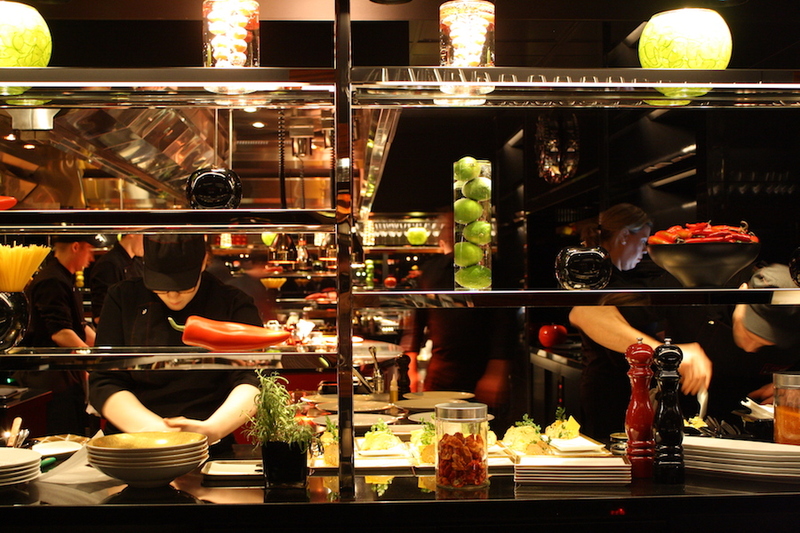 Having seen and tasted what l’Atelier has to offer, I feel that Joël Robuchon, a chef with more Michelin stars than anyone else on the planet, chose to open a restaurant in Montreal because we are such an important food city. We were not put on the map because of him. He’s here because we have put ourselves there. 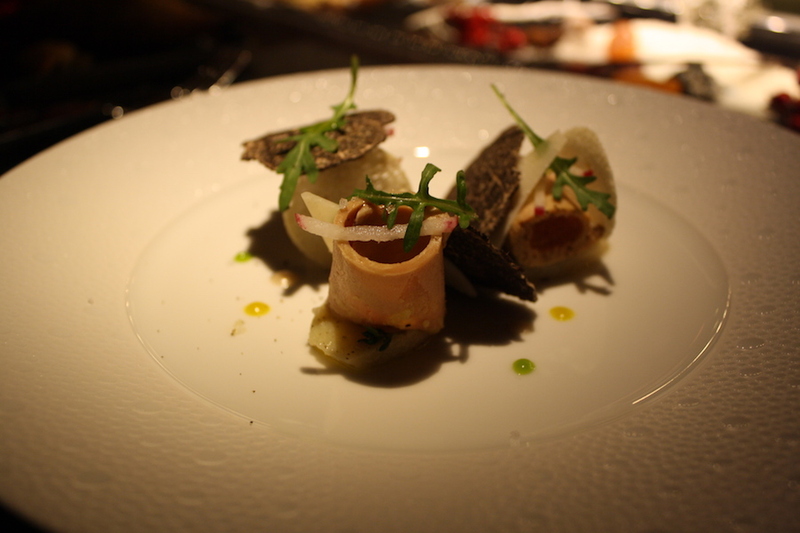 With all that out of the way I would like to share my experience at l’Atelier Joël Robuchon. First of all the fact that the restaurant is tucked away in the casino makes it a little tough to get to for the Montrealers who want to just go around the corner for a bite to eat. This helps make l’Atelier an “event” restaurant for locals like myself, a once-in-a-while place for a special night out on the town. After getting to the casino, you must work up an appetite by snaking through the casino, drifting up an escalator and heading back down a floor in an elevator that opens onto the lobby of the restaurant. At first glance the decor isn’t necessarily a style that I’m crazy about. Black and red are main stain colours of the brand and here, before even heading into the restaurant the decor feels dated but as you walk into l’Atelier there are plenty of elements that are much more pleasing to the eye. The decor is lush, comfortable and rich with modern elements that lean into a slight Asian influence. There’s a lot of red in the open kitchen as well but the kitchen is big and beautiful and filled with a staff that’s almost entirely and proudly Quebecois. We were warmly greeted in the lobby and that same warm service was repeated throughout the evening. From the sommelier to the service staff, everyone was approachable and friendly, something I wasn’t expected. Some of the staff have been with the casino’s previous restaurants for up to 25 years and their reverent approach to their clients is rarely seen, even in the grandest of Montreal’s high-end restaurants. 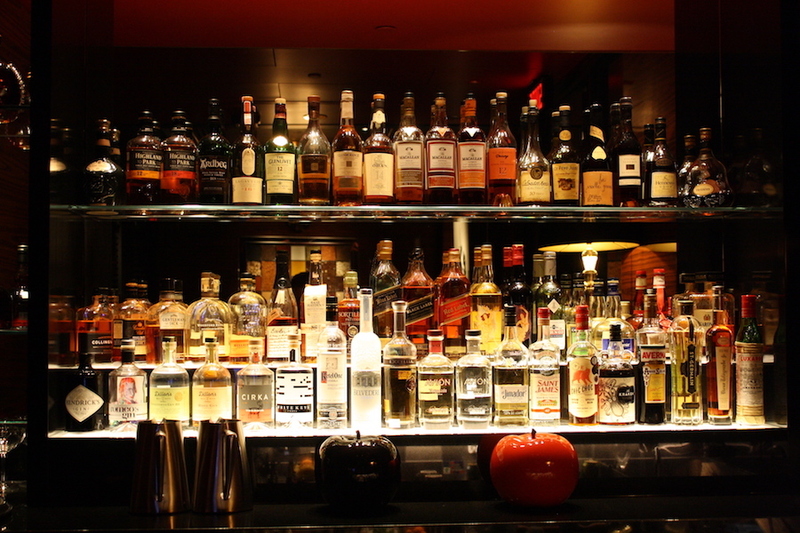 When we arrived we chose to sit at the bar having been told that its the place to be in the restaurant. We had front row seats to see all the food prepared with the same delicate touch you might see a painter use on a masterpiece. I asked our waitress if she’s ever felt nervous when bringing a skillfully plated service to a guest and she replied confidently that she was an extension of the kitchen and that she takes as much care in putting the plate in front of us as the cooks do in preparing it. As guests of the restaurant we were served an astonishing tasting meal fit for kings and queens. Starting with a glass of Veuve Clicquot and a selection of breads including a mini baguette, a fluffy croissant round and more. All breads are made in house, from scratch with ingredients sourced in Quebec. It’s very important at l’Atelier that it be known that as much of Quebec’s produce as possible is featured on the menu. Moving onto the next service we tried two different dishes due to my incapacity to swallow foie gras. 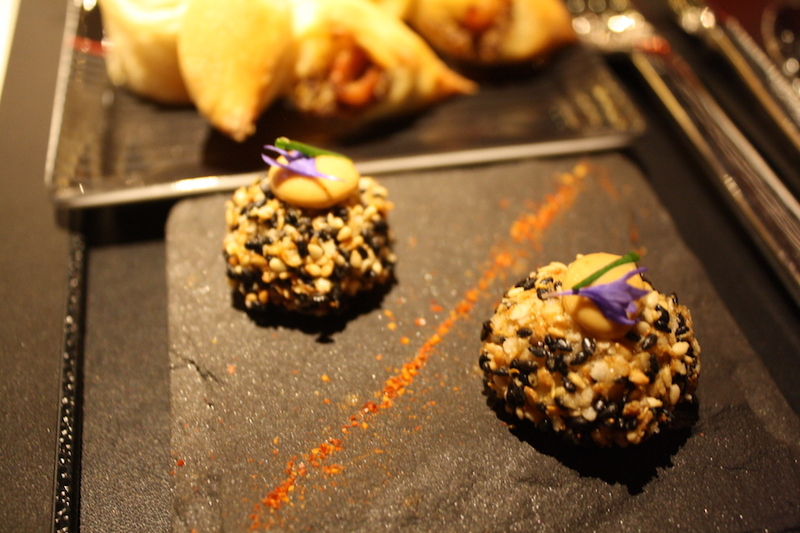 We tried la Roseval (black truffle and foie gras shavings) and little “aranchini” balls of rice coated in couscous and spiced up with pimentos and saffron. The rice balls exploded with spicy flavour and were delightful. We also tried a wonderfully seasoned scallop that had been shelled a few hours earlier making it as fresh tasting as if it had just been harvested from the sea. 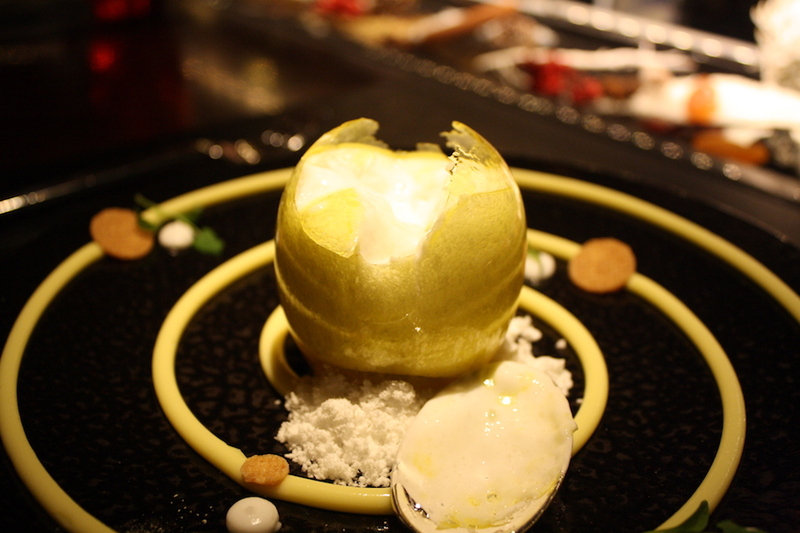 We continued our meal with one of Robuchon’s signature dishes, the mimosa egg. Stuffed with lightly seasoned snow crab and decorated with whipped yolk, caviar and edible 24 karat gold leaf, the dish was wonderful. 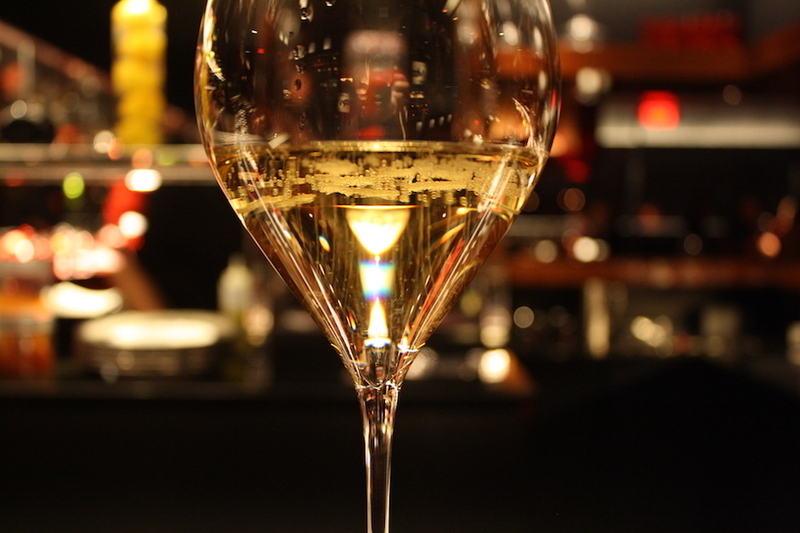 The yolk melts in your mouth and blended perfectly with the champagne and wine. 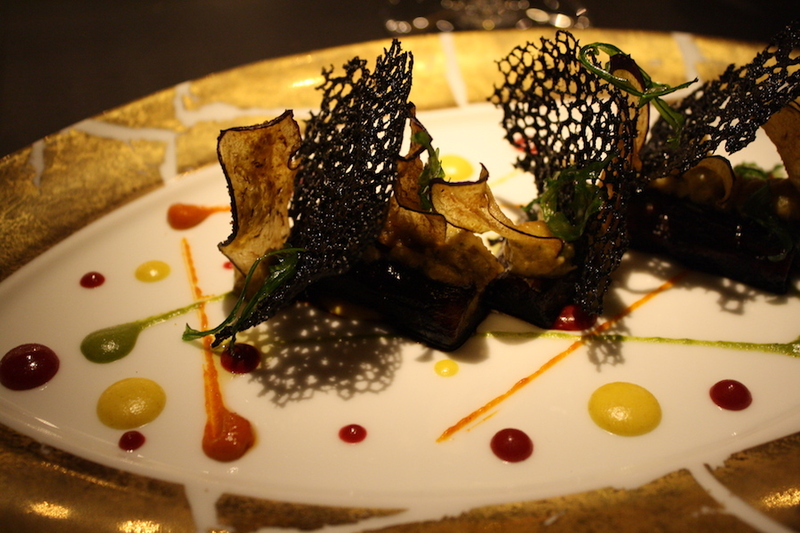 For the third service I was served a magnificent plate of aubergine prepared in different ways. On the plate tiny dollops of spices and curry surrounded the eggplant that had been either infused with squid ink, sliced into tiny chips or prepared with spices. 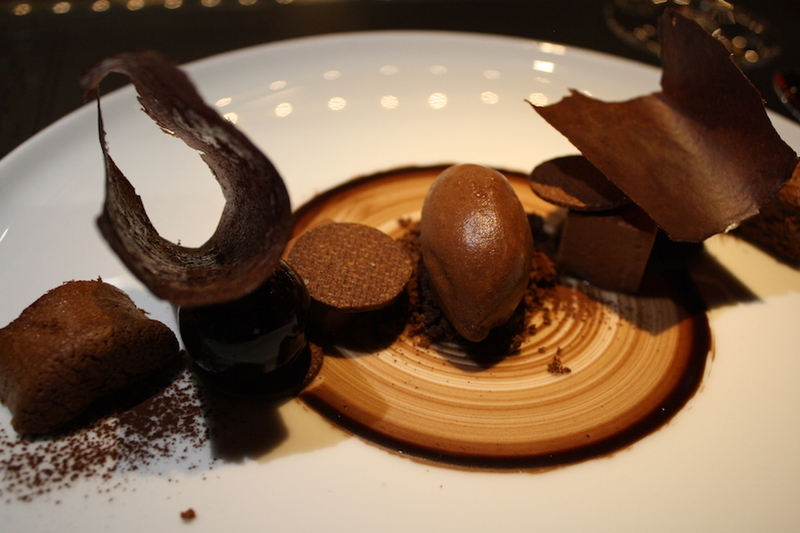 Again this dish surprised not only with the different flavours but also with texture. 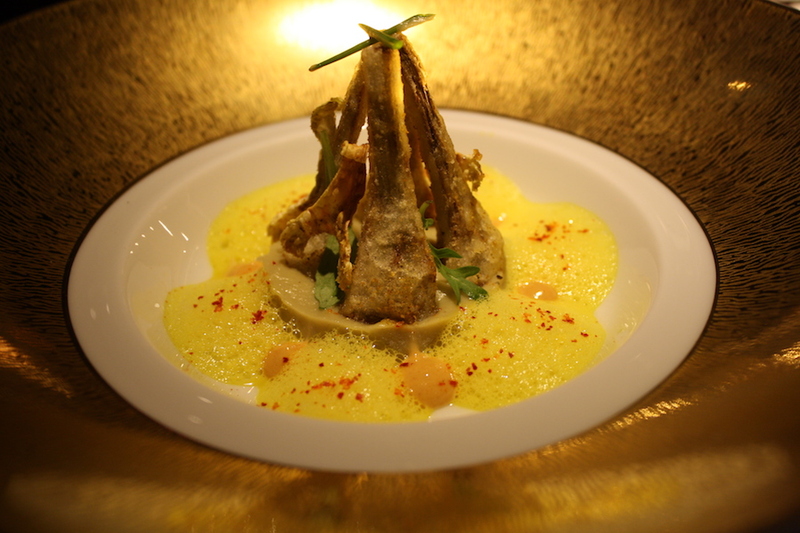 We also tried a roasted artichoke that was served on a creamy purée and topped with chic pea and turmeric cappuccino. Blackened cod is one of my favorite ways to eat fish and the brigade at l’Atelier didn’t disappoint. 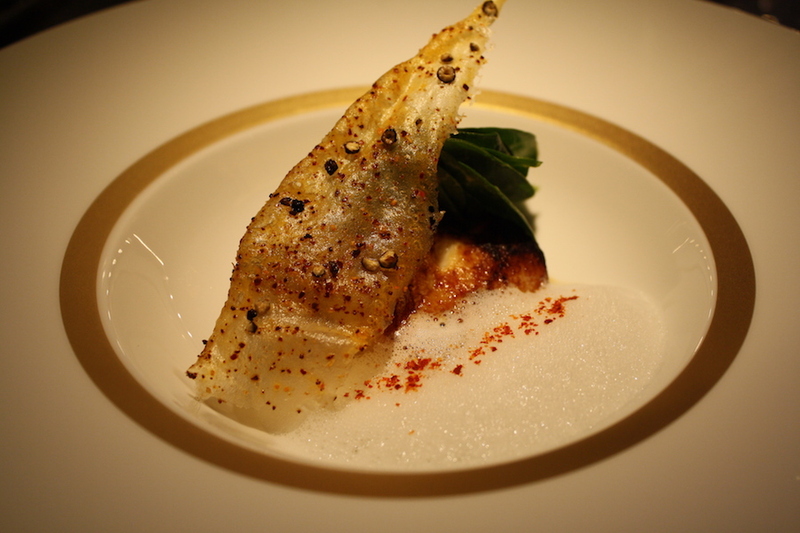 Seasoned with malabar black peppercorn and stew, the dish was simply served with baby spinach. 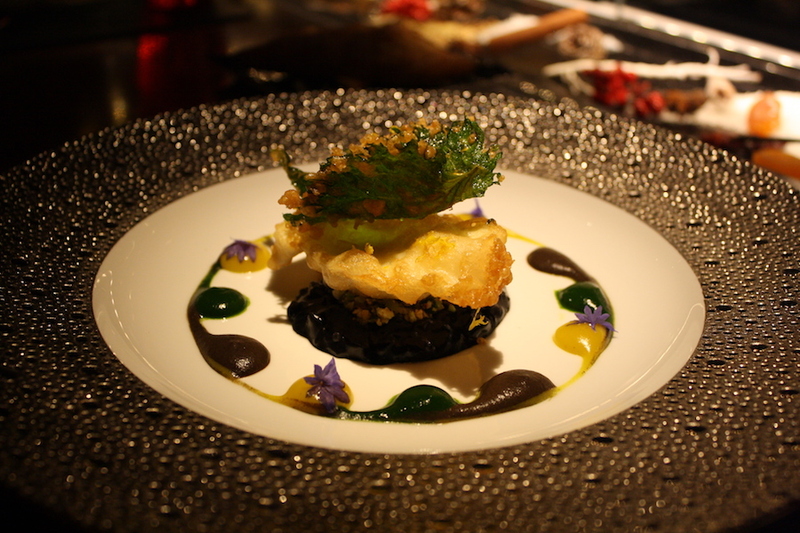 Coinciding with the cod we were also served a plate of seasoned halibut with shiso shoot tempura and cuttlefish ink risotto. From fish to fowl we followed up with a fois gras stuffed Cornish hen that, true to the sommelier’s word, didn’t taste at all like fois gras. Instead it was used to accentuate the flavors of the the bird. The skin was crispy and the meat was juicy and perfectly cooked. 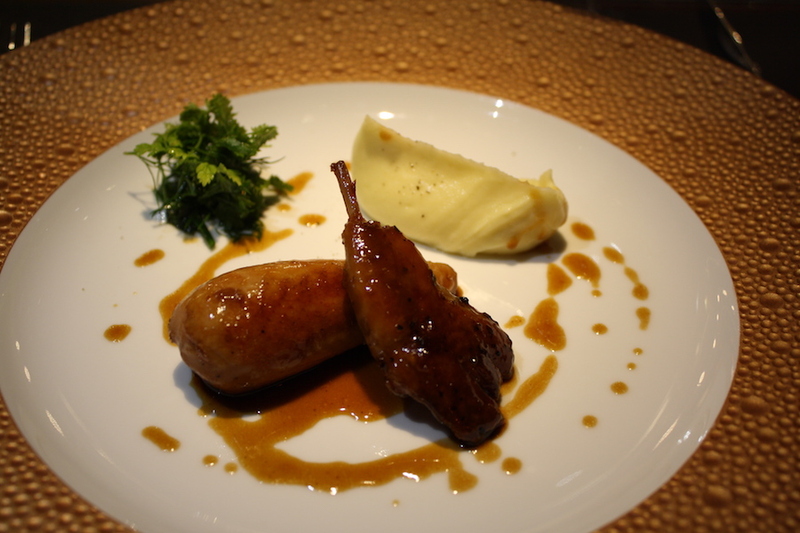 The dish was accompanied by a dollop of Robuchon’s famously buttery mashed potatoes. 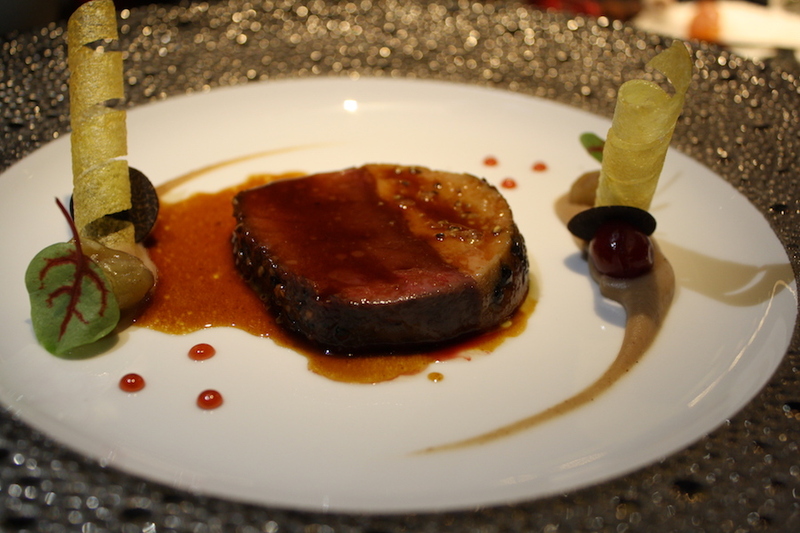 The service also included a dish of Boileau deer served with fois gras rossini and a cranberry elixir. The deer was flavourful and retained that wonderful gamey texture and taste. Just when we thought we were in the clear, the kitchen sent over the last two dishes of the evening. Our desserts were as delectable as the rest of the meal. We tried both the zingy La Bulle (blown sugar ball with yuzu-lemon, coriander and sorbet) and the sumptuous Le Choc (guanaja creamed chocolate, cocoa sauce and sorbet). We rolled out of seats at the bar after having one of the most spectacular meals we’ve ever had. Going into a French restaurant such as this I am always worried that I will come up against one of my enemies (goat cheese, fois gras or lamb) but the restaurant was wonderfully accommodating and for that I am very thankful. 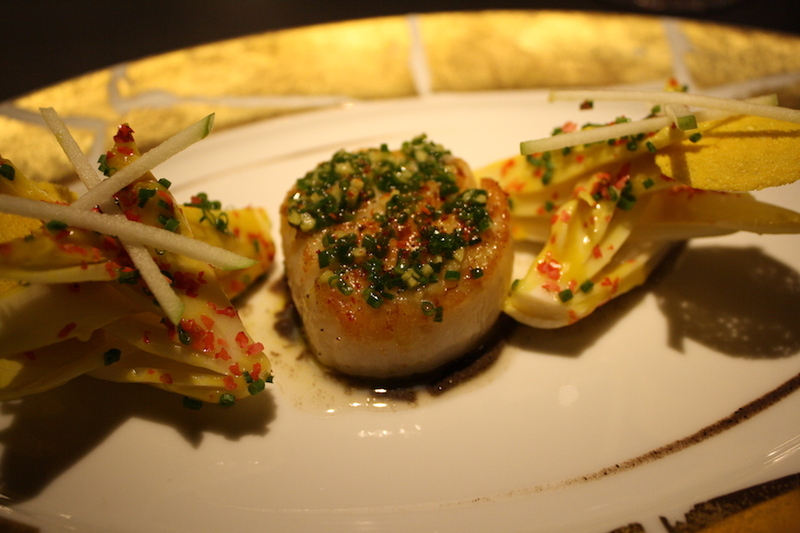 L’Atelier Joël Robuchon doesn’t take anything away from the the wonderful culinary work that Montreal chefs have been doing for the last 15-20 years. It does add to our notoriety as a city that needs to be experienced first hand to see all the talent that we’re so proud of. L’Atelier isn’t here to outshine anyone else (if they tried they I’m not so sure it would work) but if the restaurant can successfully bring fans to our city, these guests won’t be disappointed by what else they will discover. You can’t compare an experience like this with anything else and it needs to be seen and tasted first hand. There are a lot of talented people that make this work. Most, if not of all of them call Montreal home. They are among the stars that shine as brightly as the chefs and experiences like this only work to help them shine brighter. The local producers that provide the ingredients that are whipped, cut, opened and dolloped across the plates that are served to visitors coming from around the world can be proud of the work that they do because they are providing the world class meals that we all will get to enjoy for years to come. 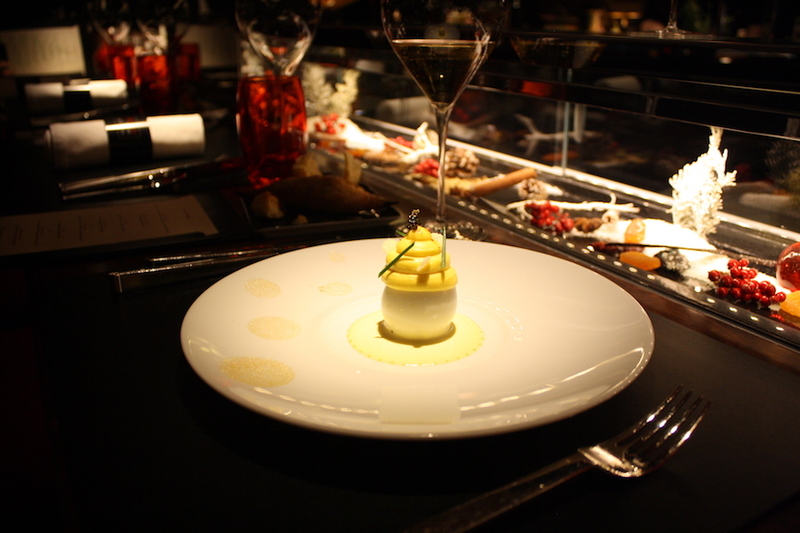 Learn more about L’Atelier de Joël Robuchon here.